July 22, 2015 – Renewal and Other Information about Your Group Medical Insurance :: Summit Agency, Inc.
With all the “news” and rumors about healthcare reform and the Affordable Care Act, it seems a perfect time to let our valued clients know what to expect in the months ahead and to remind you of some of the tasks that go with group benefits. We’re sorry that it’s long enough to cure the worst case of insomnia but we like to think that you keep this for reference. If not, we’re going to post it on the blog section of our revised website which we invite you to visit – www.summitagency.com. By law, you will get your renewal 60 days prior to your group’s renewal date (12/1 now for most of our clients) although we will get renewals 70 – 75 days prior from Blue Cross (later for the other carriers). We will analyze your options and email you our opinion and recommendations and even quotes from other carriers. Remember that if you have an “old” plan, your only change option is to an ACA Metallic plan whether you change carriers or stay with the one you now have. We will be help you through the process of deciding what to do about your benefits for the next year. If you decide to change plans, all carriers are requiring that the paperwork be submitted 30 days PRIOR to your renewal. Open Enrollment and Required Notices – Once you have settled on a plan and benefits, we will prepare Open Enrollment packets. Remember that there are federal fines for not distributing SBC’s (Summary of Benefits and Coverages which we send to you) at Open Enrollment and when an employee is hired. In addition to the SBC, federal law now requires that you also give new employees a “Marketplace Model Notice” within 14 days of their being hired. The notice at https://www.dol.gov/ebsa/pdf/FLSAwithplans.pdf basically tells your new employees that they “might” be eligible for a Marketplace (On Exchange) policy if the group plan is not “affordable” which means that the cost for the employee only premium cannot exceed 9.5% of their household income. Enrollments – When a group is initially enrolled or when a new employee is hired, each employee who works at least 30 hours per week or who is on State Continuation or COBRA must complete an application, even if he or she is declining coverage. New employees must be enrolled within 30 days of their insurance effective date. It’s a good idea to have new hires complete their enrollment forms immediately upon being hired, probably at the same time as their W-4’s so as not to miss their enrollment deadline. If you’d like for us to process the enrollment, fax or email a completed application for the employee. Then you’ll get a receipt for the transaction within 24 hours. If the 30 day deadline is near, please call to confirm that your request is processed. If you enroll an employee online at the carrier’s site, you should be able to see immediately when the system accepts the change. If an employee gets married, has a child or adopts a child and wants to add the new dependent to your group medical plan, the company must be notified within 30 days of the event. Just because an insurance company pays a maternity claim, they will not add the child without being told to do so. If your spouse also works at your business, some carriers require that the spouse be covered as an employee rather than a dependent if he or she works at least 30 hours per week. Remember that your new employees will be subject to some kind of waiting period which has already been set by your group – it can be the 1st (or 15th for some) of the month following the date of hire, 30 days or 60 days of employment. The 90-day waiting periods are no longer valid. Terminating an Employee – Texas Senate Bill 51 has been a problem for some of our groups. When you terminate an employee from your plan, the employer is to pay the premium for the remainder of that month. Sounds simple, but what if the employee terminates on the last day of the month and you do not or cannot notify the carrier until the next day – a new month? What if you pay only 50% of the employee only premium – who pays the other 50% when the employee leaves without notice? The bulletin at this link from the Texas Association of Health Underwriters will explain much about the process: http://www.tahu.org/associations/1290/files/brochureERAlert072006.pdf. If you terminate an employee in the last 7 days of the month (can be the 1st or the 15th depending on your policy “month” with the insurance company), you must notify the insurance company within the first THREE BUSINESS days of the next month or you’ll owe all the premium for that next month. If you send us an email with the employee’s name and reason for the termination of the insurance (left employment, layoff, etc. ), we’ll do the termination and send you a receipt. However, if it’s one of the last days, please contact Kathy or Daniel by phone to make certain that you meet the deadline. Remember too that you can terminate/add employees at the online employer portal for most of the carriers. We will be glad to do the adds and terminations for you if you will email us a completed enrollment form or an email with a request to terminate an employee. We will ALWAYS send you a receipt or temporary ID card. If you send a request to us and do not hear back within one day, please check to make sure your request was received. New this year – IRS forms – Since we now have the Individual Mandate for Minimum Essential Coverage, the IRS is requiring new forms (1095B for fully insured groups) that supply insurance information to the IRS who will match it to each covered person’s IRS return. The good news is that the carriers are providing these forms for all fully insured plans. These will be sent to your employees by 1/31/16 and to the IRS by 2/28/16 for the 2015 tax year. The forms MUST include the social security numbers for covered individuals. Since the carriers are preparing and sending the forms, all you need to do is always secure social security numbers for your employees and covered dependents and keep their mailing address up to date with the carrier. “Cadillac Tax” – The “Cadillac Tax” imposes an annual 40% excise tax on plans with annual premiums exceeding $10,200 for individuals or $27,500 for a family starting in 2018, to be paid by “plan sponsors.” The tax is not imposed on the total cost of the plan, but on the costs exceeding the threshold, which, after 2018, will adjust for inflation annually. The good news is that there appears to be a bi-partisan effort to eliminate or mitigate this tax. At the least, the threshold should increase to much more than the current levels. ERISA – Another issue is that the Department of Labor is starting to audit for Summary Plan Descriptions and other ERISA required paperwork which the insurance companies do not provide. You know that ERISA, the Employee Retirement Income Security Act of 1974, is a federal law that regulates group-sponsored benefits, often called welfare benefit plans. But did you know that failure to comply with all of the requirements under ERISA often subject employers to severe penalties? Besides requiring the provision of specific plan features and funding information, the federal ERISA law mandates that employers comply with strict requirements for disclosing plan information to all eligible employees. Using a “wrap document” to bundle benefits into one plan makes it much easier for employers to document benefits for legal compliance and to effectively communicate with employees. The attached article shows you some of the ERISA issues. The plan documents (Summary of Benefits and Coverages, SBC) from your group insurance company can be part of the SPD but is not enough by itself. We’ve personally experienced no client audits but have other agent friends who have had the DOL come calling. Participation Requirements – A group of 2-50 employees must enroll at least 75% of those employees NOT covered by another group plan. That means that you do not have to count employees covered by their spouse’s group plans or those covered by retiree plans among your “eligible” employees. Of course, all this applies only to employees who work at least 30 hours per week. A few carriers are now checking your participation against your TWC reports as a part of your renewal. Employer Contributions – The insurance companies require that the employer contribute 50% of the employee premium as a minimum. There are no employer contributions required for dependents. However, the employer must contribute equally or fairly for all employees. 24-Hour Coverage – Be careful here. Group medical plans do NOT cover work-related injuries or illnesses for employees or owners. Some plans used to offer this coverage to cover just the business owner but no more. Owners, officers and partners are eligible for Workers’ Compensation but sometimes exclude themselves from coverage. If you have done so, you are not covered while performing work-related duties. If you do not have Workers’ Compensation insurance on your employees, you are a non-subscriber to Workers’ Compensation, and you must file that you are in non-compliance with the Texas Workers’ Compensation Commission. Forms and information are available at http://www.tdi.texas.gov/wc/employer/cb007.html. COBRA – Federal law mandates that groups with 20 or more full time equivalent employees (whether on your insurance or not) for more than 50% of usual business days in a calendar year must offer COBRA continuation to plan participants starting on January 1 of the next year. Part time employees are counted based on the hours they work: i.e., two half time employees would be the equivalent of one employee for COBRA purposes. Administering COBRA means that you must follow certain rules and procedures that are quite specific. Improper COBRA procedures can lead to fines and lawsuits. My recommendation is that a COBRA-eligible employer hire a COBRA administration service. This is an “Employer” law not an “Insurance” law so don’t look to your carriers to administer COBRA. Your insuring company might collect the COBRA premiums for free but that’s not the same as administering COBRA for a fee with all its required notices, proof of mailing of the notices, etc. COBRA beneficiaries can maintain their group benefits for 18 to 36 months depending on the qualifying event. State Continuation – Almost all groups are subject to State Continuation, which lasts for up to 9 months for eligible employees or longer for dependents in some circumstances. Most groups of 20+ who offer COBRA must offer State Continuation at the end of any COBRA Benefit Period. Medicare – Primary or Secondary? If your group has fewer than 20 employees (not just 20 insured employees), Medicare will be primary. If you have more than 20 employees, Medicare is secondary which is why the federal government has you complete a Medicare Secondary Payer form each year. Medicare saves money if your insurance company is primary at 20+ employees. Medicare Part D Notices – Employer groups must provide a written disclosure notice to all Medicare eligible individuals annually who are covered under its prescription drug plan, prior to October 15th each year and at various times as stated in the regulations, including to a Medicare eligible individual when he/she joins the plan. This disclosure must be provided to Medicare eligible active working individuals and their dependents, Medicare eligible COBRA individuals and their dependents, Medicare eligible disabled individuals covered under your prescription drug plan and any retirees and their dependents. Prescription drug coverage is creditable if the total expected paid claims for Medicare beneficiaries under the sponsor’s plan will be at least equal to the total expected paid claims for the same beneficiaries under the defined standard prescription drug coverage under Part D. For more information, consult http://www.cms.hhs.gov/Medicare/Prescription-Drug-Coverage/CreditableCoverage/index.html?redirect=/CreditableCoverage. Group Long Term Disability – After health insurance, the next most important benefit is Long-Term Disability. What if you or one of your employees gets sick or injured (other than on the job) and cannot work? LTD plans are relatively inexpensive because claims are not that frequent. However, when a claim does happen, the benefits could enable your employee to pay the bills and keep the mortgage current. If you have LTD for your company, make sure that the salaries are updated at least annually. Also, if the LTD premiums are deducted as a business expense and not included in the employees’ income, the benefits are taxable. If the LTD premiums are deducted as a business expense but the premiums are included in the employees’ W-2 income and taxed, the benefits are tax-free. Other Benefits – Most employers offer a small group term life plan for their employees. The minimum is usually $10,000 with most small employers not offering more than $50,000, the maximum that an employee can be given before the premiums become taxable to the employee. It might not seem like much, and the employees might take it for granted, but even a small amount can make a big difference at the time of a death claim. Dental insurance is another benefit option. Employees perceive this as a very valuable benefit because of the frequency of claims. The annual maximum benefit on most plans is $1000 per insured per year. A good fully insured dental plan is running right at $50 – $60 per employee per month at this point. Or, if the employer wants, we can offer a voluntary plan which is fully paid by the participating employees. 401(k) plans encourage employees to invest pre-tax dollars to grow for their retirement. Even small groups can offer such a plan since the annual administration fees can be as low as $200-$300. Disclaimer – This memo is for general information only and is not intended to be legal or tax advice nor is it intended to supplant any information contained in an insurance company contract. Thank You – Thanks for taking time to read this and apply it to your group. As always, please call if you have any questions or concerns. Your continued business is greatly appreciated as are the new clients that many of you have referred to us. Service sets us apart from the rest. 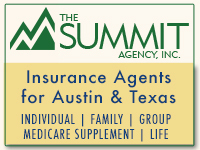 The Summit Agency is an independent insurance agency serving diverse clients throughout Texas. Whether you are an individual, the head of a family, self-employed, the owner of a small company, or represent a large organization, we are here to help you fulfill your unique insurance needs. Other agencies can offer you the same products with the same major insurance carriers. What sets The Summit Agency above the rest is our fierce commitment to service. We know that shopping for insurance isn't fun. That's why we're here.